London Luton Airport has apologised for hour-long delays at immigration but blamed the queues on Border Force. In a Tweet, the airport even urged passengers to complain directly to the Home Office department, publishing the email address they should write to. Passengers had taken to social media to complain of long queues on arrival at the airport. Some claimed people were fainting and vomiting in yesterday's heat. 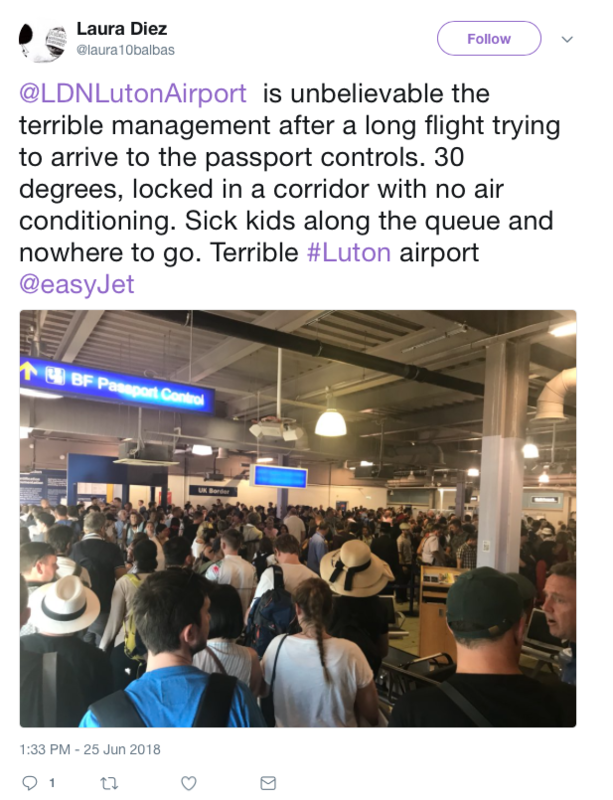 One person tweeted that sick children were among the many passengers held in the passport queue in a corridor with no air-conditioning on the hottest day of the year so far. An airport spokesman responded by saying Luton would take up the issue with Border Force 'nationally and locally' and urged passengers to do the same. The airport told TravelMole: "We apologise for any inconvenience caused by extended wait times at the UK Border. Our immigration hall is being extended and reconfigured as part of our ongoing transformation. "We continue to work with Border Force at a local and national level to ensure the best possible service to our passengers". A Border Force spokesman said he would investigate the issue. 1. Calculate real costs of employing Border Force staff & management involved in immigration control at ports and airports. Add sensible figures for annual investment in technology plus maintenance and facilities rental. 2. Divide by annual pax count & add 20%. (or some agreed percentage) for profit, staff training, etc. 3. Charge this for each arrival.as part of normal charges. 4. Privatise the lot, but return double the fee to pax who have to wait more then 10 minutes. 'Pilot' this at, say, Bristol and see how it works out. After all, if the Home Office can privatise prisons why not Border Force. It couldn't be worse than the current shambles. And this is BEFORE BREXIT - imagine how much worse it will get!